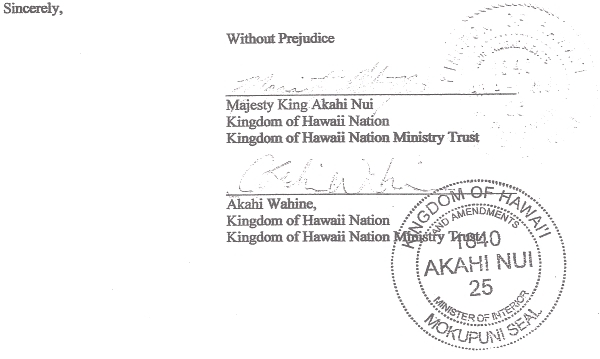 CONDITIONAL ACCEPTANCE FOR VALUE FOR PROOF OF CLAIM OF FULL DISCLOSURE AS TO THE CLAIM OF OWNERSHIP & LAND TITLE/WRIT OF POSSESSION OF KINGDOM OF HAWAII LANDS AND PROPERTY AND FULL DISCLOSURE AS TO YOUR AUTHORITY OVER SOVEREIGN HAWAIIAN LANDS/PROPERTY AND INTEREST; OFFICIAL/PERSONAL MISCONDUCT wherein the Secured Parties/Trustees stipulated and agreed to perform and accept your offer (demand/presentment/etc.) hand delivered to you, by and through your office on Wednesday August 13, 2008. 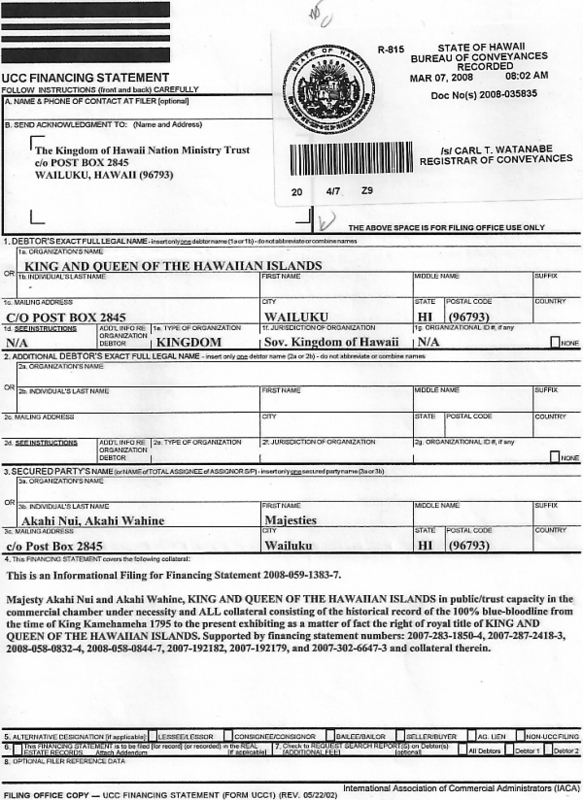 You failed to perform after receiving these presentments from His Royal Majesty King Akahi Nui and Her Highness Akahi Wahine, King and Queen of the Hawaiian Islands and Trustees for The Kingdom of Hawaii Nation Ministry Trust, and you failed to perform by providing the requested and necessary PROOFS OF CLAIM (Discovery), you failed or neglected to bring the requested evidence forth after receiving the said CAFV from the undersigned's per your receipt and acceptance thereof. 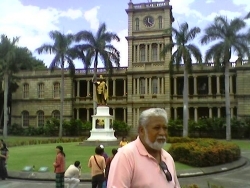 As the Respondent, you are now at fault and you are in agreement and have stipulated to the terms of the undersigned's dated presentment through your dishonor should you fail to Cure by providing requested Proof/discovery, etc..
Should this matter go into default, said default becomes the barging of the parties, i.e., Private Agreement/Contract. 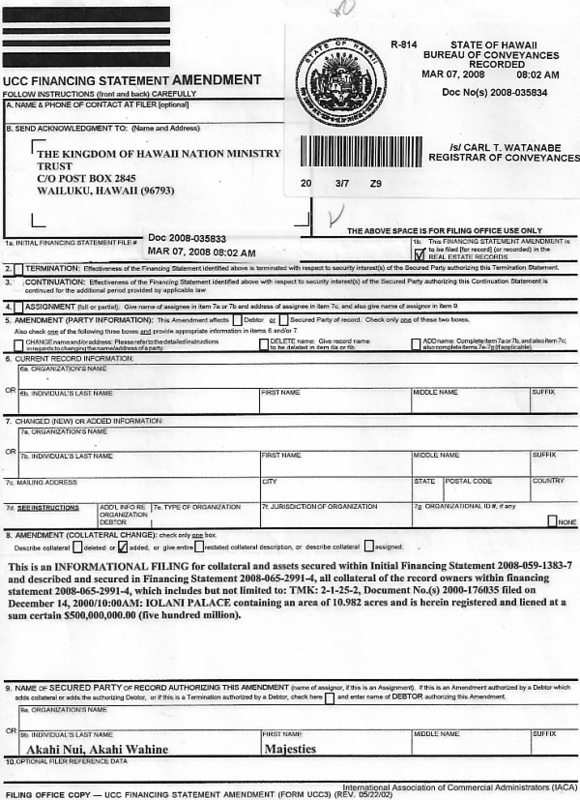 You have the right to cure this fault and perform according to said terms within three (3) days (72 hours) from the receipt of this Notice, by certified mail. 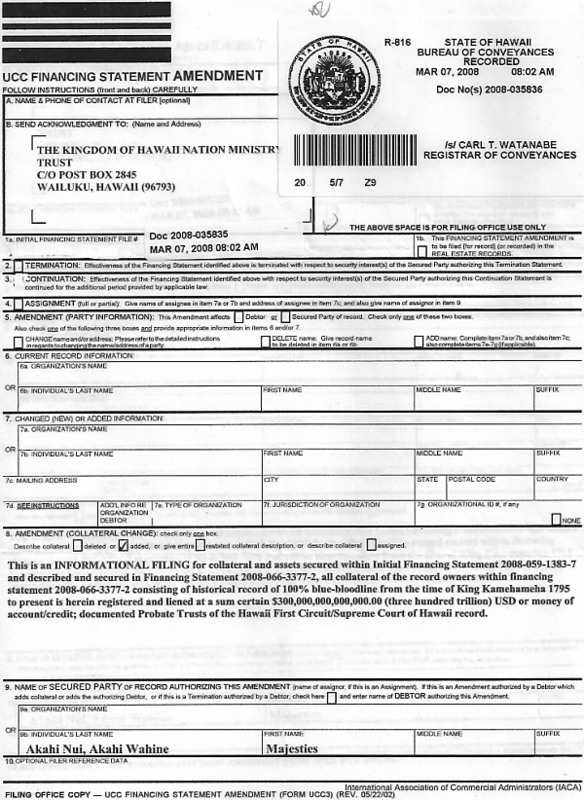 Should you fail to cure your fault, this Notice and the undersigned's following Affidavit will establish the fact in the record of your acceptance, agreement, general acquiescence and confessed judgment to the matter established upon Respondents silence, your dishonor and default with admission and confession of fraud will be established on the contract/action(s). Thank you for your prompt attention to this matter.